How do you make the most wonderful time of the year even better than just wonderful? Christmas time is such a popular time for parties and it can be hard to know how to make yours stand out from the rest. You don’t want to churn out the same old entertainment as last year, but you need something to please everyone. A photo booth is a great crowd-pleaser at parties and it’s so much fun that everybody will be sure to join in and have a go. Nobody can resist the fun and Christmas cheer of our Christmas themed prop box full of novelty Santa hats, reindeer antlers and elf ears. Even if you do find a scrooge or two in your midst, the fun of a photo booth is infectious – once they see everybody else having a great time it won’t be long until they give in and enjoy the merriment. 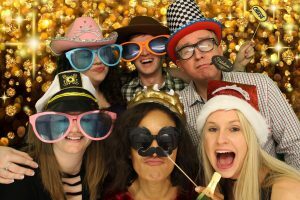 Whatever the reason for your Christmas party, a photo booth works really well with any venue and provides fun party entertainment for absolutely anyone and everyone. 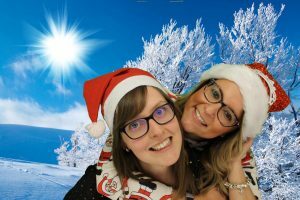 Whether you are hosting a work’s Christmas do, a club’s Christmas soiree or a Christmas charity fundraiser, a photo booth is the solution for you. If you are struggling for ideas for what to do to make your Christmas party go off with a bang, then struggle no more. Hiring a photo booth from us couldn’t be easier as we handle all of the set up and take down, as well as manning the booth for the duration of the party which takes the stress and hassle of entertaining away completely. 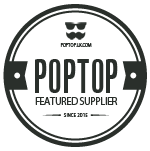 We know that the Christmas party is a hugely anticipated event that people look forward to from one year to the next and so the pressure is really on to get it just right. There’s a great deal of stress involved in planning a party that is so talked about, so let us take some of the worry away with a guaranteed crowd pleaser for your Christmas party this year. As an added bonus, the instant print out from the photo booth will serve as a great Christmas gift for your guests and you also have the added option of a key ring being printed while you wait as an extra takeaway. For the most wonderful time of the year, you need the most wonderful type of party entertainment. What better way to wish your party guests a Merry Christmas than with a night of entertainment in a festive Christmas photo booth?